Form V Geologists form a human S-wave. The rocks beneath the surface of the Earth are not stationary, but are slowly moving due to tectonic forces. When two bodies of rock are being pushed past each other, the force of friction will oppose the movement. Eventually however the force of friction will be overcome and the rocks will suddenly move. This movement will cause the surface of the Earth above to tremble and shake, and an earthquake will occur. Most earthquakes happen along ‘faults’ in the rocks of the crust and upper mantle. The sudden release of stored elastic energy in the rocks produces seismic waves of three sorts: P, S and L waves. L waves are undulations of the Earth’s surface and although they cause most of the damage and destruction in an earthquake, they are of relatively little interest to geologists. P and S waves travel through the body of the Earth and thus give information about the underlying structure of the Earth – as they are refracted, reflected and truncated on their journey through to seismometers in recording stations around the globe. P waves are ‘push waves’, and can travel through liquids (e.g. 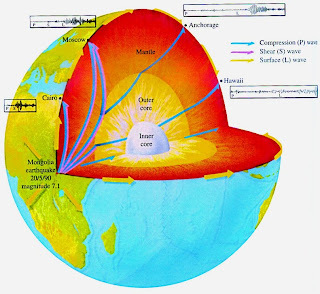 the outer core), but S waves are ‘shear waves and can’t travel through liquids.